When you have a successful, long running book series, it’s only logical to make a film series based on them and for the most part this has turned out to be a very successful process. “Harry Potter”, “Lord of the Rings”, “the Hunger Games”, “The Chronicles of Narnia” and even “Twilight” have become very successful film franchises that can even help open casual viewers to their book series. But then we have “Percy Jackson” which I always acknowledged as the rebel of the bunch. On their own, it’s an excellent book series that I still enjoy reading to this day, however it’s not in the same boat as “Lord of the Rings”, “Chronicles of Narnia” or “Harry Potter”. I’ve always wanted this book series to become a more acknowledged piece of culture the same way the other popular books are and the best way is through a strong film series. In 2010, we had our first film attempt titled “Percy Jackson and the Olympians: The Lightning Thief”, it wasn’t exactly a great movie but it was a decent start to a series and managed to be a very entertaining adventure themed around Greek Mythology. However, if the series hopes to be on par with the other popular book adapted film series, it really needs to pick up its game and deliver some really good sequels. Now we have the first official sequel in the franchise titled “Percy Jackson: Sea of Monsters”, and dose it succeed in raising the bar for the series, the short answer is unfortunately “no”, not really. Let me put it this way, the movie wasn’t completely terrible, it just wasn’t anything special. Everything felt average in this film, the characters are very stereotypical characters, the performances are kind of bland, the action is basic action and the story is all too familiar. Percy Jackson and friends are out on a quest to find the Golden Flies which will heal an ailing magical tree that protects their land from evil. They travel through the Bermuda triangle to retrieve it while battling many obstacles and monsters along the way. They also recruit new allies on their quest including a Cyclops that claims to be Percy’s brother and a self centered woman who fights first and asks questions latter. Not a bad set up for a family adventure and it is entertaining on some levels, it just doesn’t have any substance that will leave an impression on a regular audience. It’s not hard to predict how the film turns out and it rarely feels like the characters are in danger, especially when they have a golden flies that can heel any wound. Whenever a character comes close to dyeing, you never feel concerned because you just know nothing series will happen to them and nothing ever dose. Plus the hummer in this film is just plain bad, there’s an annoying scene with these three cab drivers and countless moments when the film aims for a big laugh but fails miserably on the punch line. To be fare the film does have some genuinely exciting sequences, when Percy Jackson and his crew are swallowed up by a giant sea monster, they end up trapped in its stomach and need to find a way out before getting digested. The interior design of this monsters belly is actually quite impressive and leads to some fun action pieces. If there’s anything positive to be said about this movie, it’s definitely the overall look and production of it. There’s lots of atmosphere and it looks beautiful. Half the time, you feel like you’re on a theme park ride. My favorite scene is when Percy Jackson encounters an oracle that shares with him a prophecy that involves his destiny and the fate of Olympus. What follows is one of the most unique and colorful vision sequences ever put to film, the details, the color, the style, it’s just a visual marvel to behold. Aside from that, this film doesn’t offer much else that hasn’t been done before and done much better in other films. If you’re a really nitpicky viewer then your definitely not going to enjoy this film because its chalk full of plot wholes and convenient twists. If you want a simple adventure flick, this really isn’t that bad and has its entertaining moments, there are just much better films that I’d recommend first. Some fans of the books may like it but if you’re not familiar with the series, you won’t even bother to remember this movie and I doubt it would get anyone interested in reading the book. 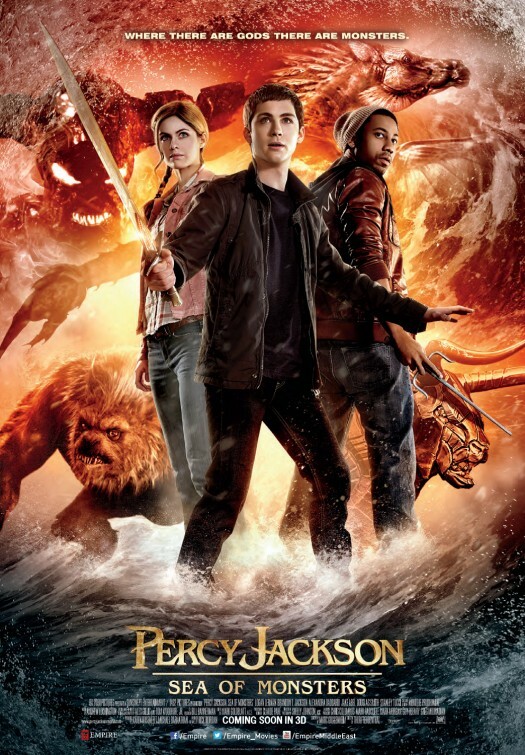 I give “Percy Jackson: Sea of Monsters” 2 ½ stars.